This book chronicles 5th and 6th grade writers - children of gang members, drug users, poor people, and non-documented and documented immigrants - in a rural school in the southwest US coming into their voices, cultivating those voices, and using those voices in a variety of venues, beginning with the classroom community and spreading outward. 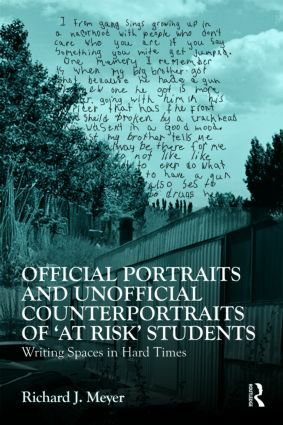 At the heart of this book is the cultivation of tension between official and unofficial portraits of these students. Official portraits are composed of demographic data, socioeconomic data, and test results. Unofficial counterportraits offer different views of children, schools, and communities. The big ideas of official and unofficial portraits are presented, then each chapter offers data (the children’s and teachers’ processes and products) and facets of the theoretical construct of counterportraits, as a response to official portraits. The counterportraits are built slowly in order to base them in evidence and to articulate their complexity. Many teachers and soon-to-be teachers facing the dilemmas and complexities of teaching in diverse classrooms have serious questions about how to honor students’ lives outside of school, making school more relevant. This book offers evidence to present to the public, legislators, and the press as a way of talking back to official portraits, demonstrating that officially failing schools are not really failing - evidence that is crucial for the survival of public schools.